Becca Kufrin and Garrett Yrigoyen have dished on what it was like to date in disguise while The Bachelorette was airing and what they've learned about each other since getting engaged. Becca and Garrett got engaged at the conclusion of The Bachelorette's fourteenth season, which aired on ABC last week. As fans are well aware, Becca and Garrett need to sneak around and see each other at planned -- and very remote -- "happy couple" gatherings as to not spoil the secret of their relationship and ruin the ending of the show. "It's fun to get to know each other outside of the show, and we obviously get to spend more time with one another," Garrett told E! News in a joint sit-down interview with The Bachelorette star about what it's been like to date off-camera. "But when she gets really tired, she starts to speak off topic, and I know that's my cue to just say, 'Hey, I love you, goodnight. And I'll talk to you in the morning.'" "We've had conversations where I've told him stories or things that never even happened, and I'll wake up halfway through and be like, 'I don't know what I was just saying to you,'" Becca told E! News with a laugh. "She started talking about an Ed, and I was thinking in my head, 'I don't know where this story is going,'" Garrett recalled. "And then she cuts herself off midway through and goes, 'Oh my gosh, I don't even know who Ed is.' What are we talking about?" Garrett then admitted, "I was like, 'Where did that even come from?!'" "I sleep talk and I sleep walk a lot," Becca confessed. "So that's something that he's seen now." "Yeah," Garrett admitted with a laugh. "She snores a lot too!" "She snores, which is fine," Garrett continued. "And then sometimes, she'll hit like a mid-conversation drool. She'll be like, 'I'm pretty sure I just drooled!' And I'll be like, 'Yeah, I saw it!'" When they snuck around, visiting each other during the show, Becca gave Garrett a mullet wig to wear. "It's something a lot of people don't get to experience, but I thought it was a lot of fun getting to do that," Garrett told E! News of his experience post-show. "Her name in my phone was Veronica Bushelpeck, but now I get to change that up. It's kind of fun still, calling her a different name." As Becca previously revealed, she called Garrett by the name "Vincent" while The Bachelorette was unfolding on television. "I want him to stay in my phone as Vincent. But now his family got onboard with it, and so we all had code names with his parents and his brother and sister-in-law, and so, it's just been fun," Becca gushed. "Of course we wanted this moment where we could finally be in public, but you have to embrace the moments where you can still be secretive and get to know one another away from all the crazy show life. So it's been fun." 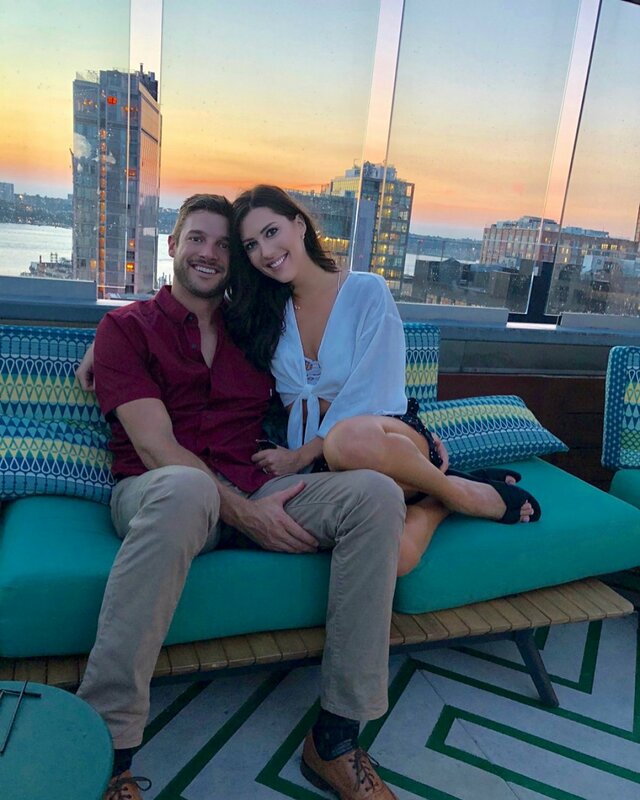 Becca and Garrett have said they will be moving in together soon and probably starting their life together in California rather than Garrett's hometown of Reno, NV, or her hometown of Minneapolis, MN.